Total Reported Spending at Independent Retailers and Restaurants on Small Business Saturday Tops an Estimated $100 Billion since the Day Was Founded by American Express in 2010 ~ New York (Business Wire). You may be asking what does an event like Small Business Saturday – which occurred 2 weeks ago, have to do with quilting, sewing or creativity in general? Actually, there is more in common than you might think. People, like myself, that are driven to create and share that creative spirit are the small business owners that thrive in the entrepreneurial environment SBS was designed to foster and support. Each year since 2010, the first Saturday after Thanksgiving, (sandwiched between Black Friday and Cyber Monday) has been designated as Small Business Saturday. The intent is to generate a renewed interest in small businesses and restaurants while simultaneously helping these local entrepreneurs compete with larger retail outlets for holiday shopping customers. I’m all for anything that gives any small business an economic boost and I make it a priority to participate and contribute in any way I can. As for me, I love the personal attention you receive in a small business or restaurant and I will choose first to frequent these shops any time of the year. My goal for next year is to create a quilt fabric road trip” – or, “MyQuiltingSpace Trek – Part 1” and see how many businesses I can visit on this one day. Although my primary intent will be to spend money, this will also serve as an excellent opportunity to discover businesses that are new to me and to meet and network with these inspiring and innovative business owners. As a tribute to the individuals and their respective businesses who consistently provide me with endless inspiration (and fabric!) my contribution for this year’s event focused on the two stores listed below. I feel so fortunate to live only 2 miles away from such a wealth of fabric, patterns, notions and expertise. This one-of-a-kind quilt shop is locally owned by Rita Briner and specializes in primitive fabrics as well as reproduction prints, woolens, flannels, and home spun wool. Walking through the isles viewing bolt after bolt after… of fabric you soon realize this experience is no different from being a kid in a candy store. Each time I walk through the door I pretty much lose my mind and almost immediately find myself darting off into a myriad of directions. I’m easily drawn to the patterns or woolens sections although my original intent was look for cotton fabric that would pattern and color and coordinate with the fabric swatches in my hand. Am I the only one that does this? I mean just take a look at the image below…what you’re viewing is just a very small sampling of the eye candy you’ll find when you first walk through the door! Stay tuned to see the transformation of these fabrics into something that will warm your heart and soul! I could write a novel on this mercantile wonderland – what I refer to as the “Quilting Mecca of Missouri”. It is actually several stores that occupy a large portion of all available retail space within downtown Hamilton, Missouri. Each of the 14 different quilting shops that encompass the Missouri Star Quilt Co., is decorated and stocked according to a theme. For example, ‘Batiks Boutique’, ‘Man’s Land’ the ‘Machine Shop’ and ‘Penny’s Quilt Shop’. Should you be interested, you will find doing even a small amount of research on the origins of the MSQC and owner, Jenny Doan to be very worthwhile and inspiring. The connection between the MSQC and JC Penny is also quite interesting. I never tire of hearing her story. Traveling to the MSQC is a good 1 hour and 15 minute drive from my home so needless to say it is not a shop I am able to physically frequent too often but the online store is every bit worth a visit. This is how I used the Missouri Star Quilt Co., to contribute to SBS. The day I discovered the MSQC I subscribed to their daily emails so turning on my computer and opening my email was the most effort I had to make! From my home and the MSQC home page I was able to shop a huge variety of fabrics, patterns, kits and notions. On this day, I was able to make use of the “Daily Deal” and with the offering of free shipping and other freebies I was delivered a box of goodies that made me feel like it was Christmas morning! 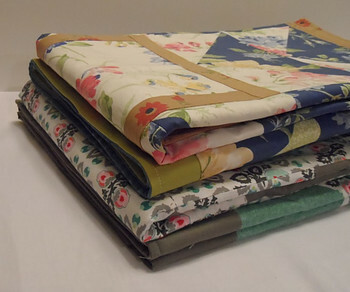 Taking a look at the website earlier today with the hope of making a second purchase makes me more thankful that I bought this fabric bundle when I did as it is now listed as “Sold Out Forever”. Whew! Thank goodness for Small Business Saturday and the Missouri star Quilt Company! These winter themed fabrics will make a wonderful quilt. I have in mind a couple of patterns I’d like to use with this fabric. As soon as I decide and begin that project I will be posting about that process so stay tuned! So how does spending money at a small business or restaurant make you a better person? Every few months we read where a large powerful company purchases another large company. And then another. The fear of consumers and small business owners alike is the inevitable end result – one or two large oligopolies whose purpose is to seek out other smaller businesses to purchase and control leading to a market monopoly. Is a retail monopoly really so bad? A large homogenized behemoth that disregards the value of the individual creative spirit and stifles efforts to facilitate innovation and ingenuity may provide convenience to the masses in the short term but the long term effects can be devastating. Historically, the existence of a lack of diversity within any culture has resulted in the death of many natural entities – species of animal, human and horticultural life to start with. It is my hope that through the efforts of Small Business Saturday and other entrepreneurial events that the public will take notice and do what we can to preserve these valuable community establishments. As our communities prosper, then as consumers, we too share in that prosperity. The skills and talents of local businessmen and women will always need a platform for expression and service. A large, soulless corporation does not allow for this. When you support any small business on Small Business Saturday as well as every day of the year you become a wiser, happier, more responsible and valuable consumer. And these attributes are what make each of us a better person. The Magic Trick to Sewing Seams That Line Up Perfectly – Everytime! To create a fabric panel where every seam and every corner of every square is perfectly matched? I guess the answer depends on your definition of magic and the number of seams you’ve ripped out and re-sewn trying to get those seams to nest and perfectly line up. As for myself, I’ve ripped out way too many stitches and usually for a simple project made up of nothing but squares! So when I discovered quilter’s grid I felt like I had won the lottery! The first time I tried this product I had only one word for it – magic. The “Magic” is in the interfacing – specifically, Pellon 820 Quilters Grid. It not only transforms scraps of fabric into nice and neat pattern but it can do so with greater seam accuracy, less time and fewer headaches than sewing row by row using the traditional piecing methods. For me, the time-consuming aspect of piecing (40) 2″ squares lies in the mistakes made, seams ripped out and stitches having to be re-sewn. Using Quilters Grid Interfacing to piece the fabric squares above was done WITHOUT RIPPING OUT ONE SEAM! Ever. Remember in a previous post where I described the necessity of cutting accurately so seams would nest and line up perfectly? And no matter how perfect the cut and alignment, if a consistent 1/4″ seam isn’t sewn then the whole block will look a mess? The 2″ square (or whatever dimension you desire) does not have to be exactly perfect but it does need to fit within the grid lines. Basting is replaced with fusing. A couple of seconds with a hot iron and the interfacing is semi – permanently fused to the back of the fabric. 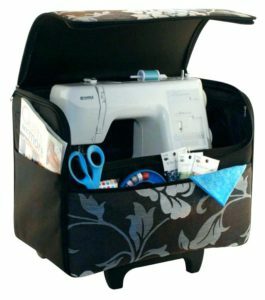 This allows you to move the entire piece from ironing board to sewing table and then move the piece around the machine as you sew without the worry of it shifting or moving out of place. This is a thin fabric made from 100% polyester. It has a rough side where the adhesive is infused and a perfect 1″ grid printed over the entire surface that is visible from both sides. 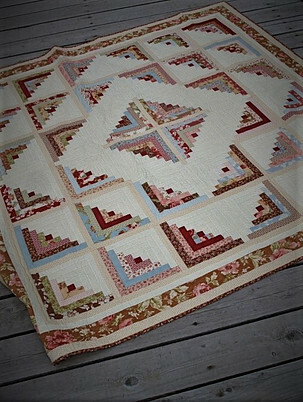 Have you seen what is often referred to as a “Postage Stamp” quilt? 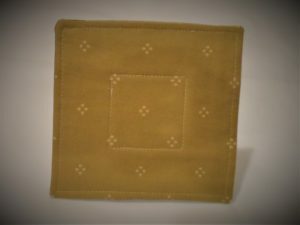 Typically, it consists of a series of many, if not hundreds, of tiny 1″ or 1.5 “(“postage stamp” size) squares of fabric sewn together in neat rows. 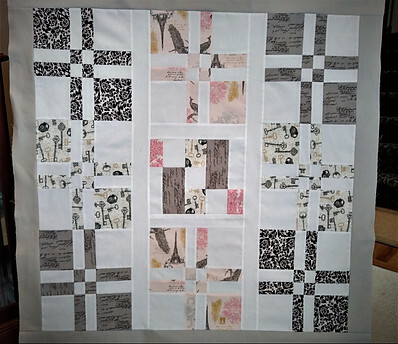 I can’t say for sure if quilter’s grid was used here but if it were me making a postage stamp quilt top like the one shown above (from RedPepper Quilts), quilter’s grid interfacing would be the only way I would be able to get every square to line up so straight and perfect. Up to this point I’ve discussed the positives of this product however, there is a downside that it worth a mention – using an interfacing such as this does alter the drape of the fabric. The nature of this product is to reinforce or strengthen fabric and as a result will cause the fabric to stiffen up. If a quilt’s drape or, ability to bend and fold easily (say, for snuggling) is most important then piecing small squares using this grid may not be the best option. 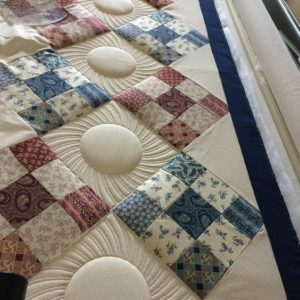 For many of us who quilt, and especially those starting out, we may not be at point where this level of perfection is necessary and would rather take the philosophy: “Better Finished Than Perfect”! If you still want to use the quilter’s grid interfacing and more drape is desired, then I would suggest using larger fabric squares (6″ or so) or even rectangles! This will allow more space between the stitch lines and the end result isn’t a fabric panel that is too firm and stiff to work with. Place a 2″ square of fabric within (4) grid squares on the back (rough, adhesive side) of the interfacing. Place a non-stick pressing cloth on top and using a hot iron, press, holding the iron n place 3-4 seconds. Raise the iron and move to the next section pressing (hold down only – do not “iron” or slide the iron from one section to the next). This process will adhere the rough side of the interfacing to back of the fabric. In my example, I have fused (40) 2″ squares into a rectangle measuring (8) squares wide x (5) squares deep. I find it easier to start with the short rows. – Fold ON the grid line. Keeping the fabric WITHIN the grid lines allows for the fabric to fold almost automatically and exactly on this line. Once the entire row is folded, stitch a 1/4″ seam from the folded grid line. (It’s not visible in this picture but I’m using a 1/4″ presser foot with a “fence” along the right side to ensure a consistent 1/4″ seam. – Continue stitching each of the short rows. – Iron the seams so they lay flat. * Note* I’m not sure if anyone else does this but when I’m using smaller 2″ squares, after stitching, I will trim 1/8″ from the fold line. It significantly reduces the amount of excessive bulk and makes it so much easier to iron flat when finished. If larger squares of fabric are used, this step could be eliminated. You can see in the image above the squares have been stitched along the shorter rows and the corners don’t perfectly line up but there is nothing to worry about! Once the perpendicular lines are stitched every corner will magically match up! – Fold again along the lines perpendicular to the ones you just stitched. The image below illustrates the fabric’s appearance after the short vertical rows are stitched. I used clips to keep the rows straight while stitching the longer horizontal rows. Should this be your first time using this technique, don’t worry if things look a bit weird. A quick glance at the panel before ironing it flat will make you think you’ve done something wrong! However, don’t let the appearance discourage you – iron it all out and the result is…magical! Once you’ve completed all the steps above the result is a fabric panel that you can do most anything with. Depending on the size needed and the specific project, this could be just one of five panels that you could sew together to make a tote bag. In my example below I quilted a solid gray fabric to the back. In the interest of time I took a couple of short cuts by rounding the corners and sewing a remnant of store bought piping around the entire perimeter to give it a proper finished look. The result – a nice sized mug rug! Had I more time to spend, I could have finished the edge by attaching binding. Another option – sandwich with a backing fabric and batting, turn inside out, top stitch and the result could be used as a hot pad on your counter top or as an over sized pot holder. Looking at this I am able to envision a multitude of possibilities! I can also see this as a front panel for a pillow. Simply add a contrasting border, backing fabric, piping around the edges then fill with poly- fill or a pillow form! What ideas do you envision with this technique and this product? 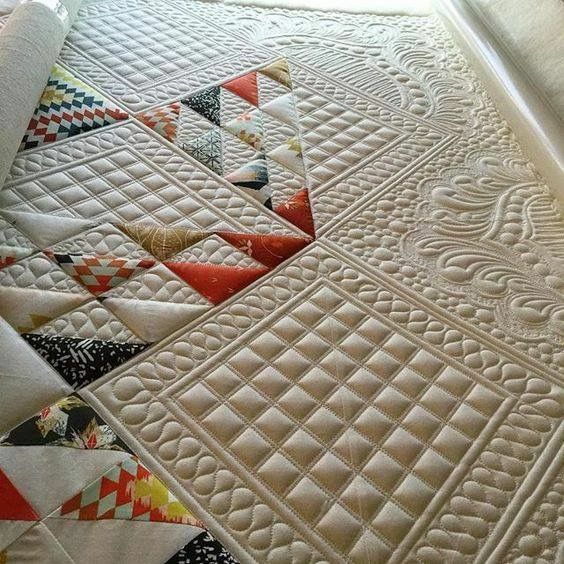 If you have used Pellon 820 Quilters Grid and this or a similar technique before please leave your comments and / or pictures below! I’m continually inspired by the creativity shown by readers like you! 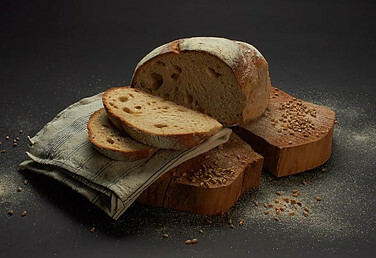 It’s been a while since the onset of the specific technology which led to the phrase, “Better than sliced bread”. Since the turn of the century (the 20th century), to be exact. And during the time span between then and now the technological curve has taken a sharp bend and continues to do so today. Growing up I witnessed very few spectacular inventions. My parents had the same rotary phone for who knows how many years before upgrading to a push button phone and continued to use that same phone for at least 30 years. I used the same black and white television from childhood through my sophomore year in college. Who does that anymore? So what does all this have to do with sewing and quilting? Technology and the always changing landscape of new and improved products. Every day – every few hours someone has or is in the process of inventing a better mouse trap. The better mouse trap I’m speaking of here is the Oliso iTouch Iron. I’ve been using mine for almost 2 years now and for the most part I have no real complaints. Maybe, except for the color. The gray and white is not bad but I wanted yellow…not a huge big deal. However, for all its technological advances, the greatest attribute of this iron is safety. The design and functionality have incorporated a special feature called “Auto-Lift Technology” that renders the iron pretty much impossible to burn anything or accidentally tip over. 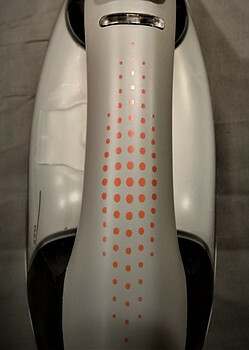 The iron is never in contact with any surface unless your hand has a firm grasp on the orange dotted sensors placed across the top of the handle. Grasping the handle automatically lowers the iron onto the ironing surface. Once you remove your hand a set of “Scorch Guards” lower, lifting the hot sole plate off the fabric and will remain in this position until you grasp the handle. OK, So It’s Safe But Is it Any Good at Ironing? The short answer: Yes. This iron also includes the same features you would find in a typical iron found in use in many homes today – a reservoir for water, steam and spray settings, a fabric and temperature selector, and a pointed tip for detailing. Another nice feature is the light display. When red this alerts you that the iron is off or has automatically shut off after 8 minutes of non use. 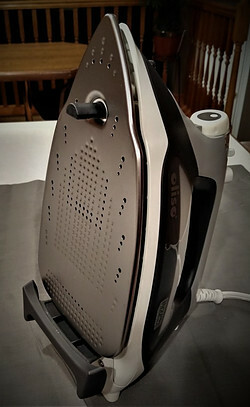 (There is Pro version of this iron that will remain on for 30 minutes of non use). When the light is green this lets you know the iron is on and ready for use. 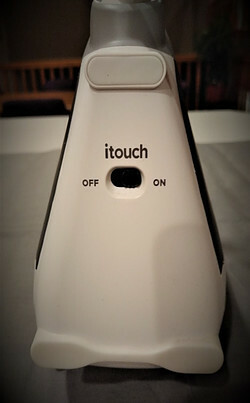 If a more traditional ironing experience is preferred the iTouch feature can be switched to the “Off” position. When not in use simply position vertically as you would a traditional iron. Getting back to safety – even with the iTouch feature turned off, should the iron accidentally knock over into a horizontal position, the scorch guards will automatically engage to lift the sole plate off the fabric. With these safety features you may be thinking they must have skimped on the remaining attributes or reasons for purchasing an iron in the first place. Q: What about leakage through the steam outlets from the water reservoir when the scorch guards are engaged? A: They have that covered. The iTouch iron has a “zero-drip” feature that automatically shuts off steam anytime the scorch guards are extended. Q: Is there more than one steam option? A: Actually, there are 3 options for water or steam delivery. 1) A simple spray which is good for removing wrinkles. 2) Burst of Steam – A strong downward steam delivery when temperature is set on the wool/cotton/linen setting. 3) Vertical Steam – Useful for removing wrinkles from curtains or garments oriented in an upright position. Now that I’ve covered the positive features of this iron it seems only fair to discuss the two items I’ve discovered, so far, that I’m not entirely thrilled with. The first: The noise. Each time the auto-lift feature is engaged it makes an annoying noise. I don’t quite know exactly how to describe it as it is not terribly loud but it is there. Over time, I’ve learned to tune it out – somewhat – however, there are days when I really don’t care to hear that noise each time, I grasp the handle. The second is the overall weight of the iron. It isn’t heavy – 3.7# however, I had a much older iron – just an iron with no bells or whistles. It was smaller than the Oliso but significantly heavier. Somehow, the design of this older iron made ironing much easier and quicker. One run over a wrinkle and that was it – gone forever! With this, and every newer iron I’ve owned in between required many runs back and forth before removing a wrinkle. As you can see, the positives far outweigh the only two negatives I have encountered with this wonderful iron. The safety features alone are worth the price of admission! 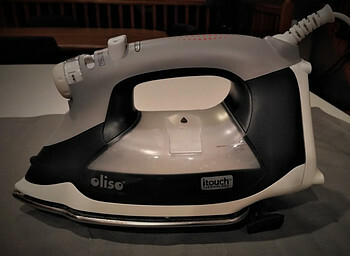 I would love to hear about your experiences with the Oliso iTouch iron. There are also so many other great ironing products on the market – let me know your experiences with another type or brand of iron and which brand you prefer! I’m always on the look out for a better mouse trap! This question could apply to almost any topic. Why make anything? In this day and age when basically most every item you need can be commercially manufactured, mass-produced and purchased at a much lower price and in less time, why would you go through the time, trouble and expense to make anything – especially a quilt? I have to be honest, when someone asks me this question it is not any easy one to answer. Especially when there are a number of online avenues that advertise ” 3 Piece Quilt Sets” for under $100 or $200. Add to this, the number of retail chain and outlet stores that have many, many quilts/comforters/blankets available for sale in all sizes and price points, the idea of making a quilt gives me pause and has me asking the same question. The simple cost of making a quilt alone certainly adds to the difficulty justifying such a venture. However, …there are many qualities that distinguish the quilt or blanket you buy in a brick and mortar or online store from what you piece and quilt yourself. 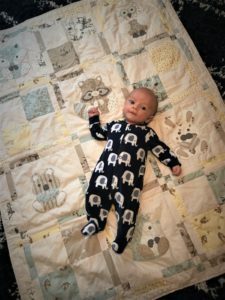 Below are the top five reasons why I love to make quilts and the reasons why I will continue to make quilts for probably as long as I live! Designer quilting fabrics are manufactured using the highest quality materials and techniques. The thread count is higher than basic cotton or cotton/blend fabric – typically 60 x 60 threads per square inch. However, some fabrics have a higher thread count. These fabrics almost feel like silk. Take a look here if you want to read more on designer quilting fabric. 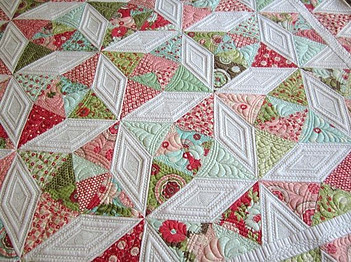 In this sense, I’m referring to the quilt pattern as the specific color or colors of the various shapes sewn together to create the overall quilt appearance – the “How it looks”. 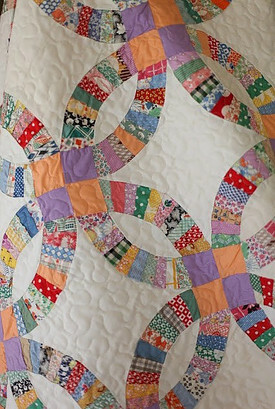 For example, let’s say you are in the market for a quilt pieced into a “Double Wedding Ring” pattern using fabrics from a favorite designer and / or manufacturer, the most probable way to accomplish this is to make it yourself – (or have it made). Another scenario – you have cherished fabric from clothing worn by your children when they were young and want to use it to create a quilt in the double wedding ring pattern to give as a gift when they marry. The only way to make that particular quilt is to make it yourself. That specific item will not be found on eBay or Amazon! This describes the actual “quilting” process – the design used with needle and thread to create the “quilted” appearance. This example shows a very traditional design – the Continuous Line Cross-Hatching pattern on a very traditional quilt pattern – the Irish Chain. You can read more about this quilt here. Looking closely at the image below a variety of quilting patterns have been used. This snot only adds dimension to the quilt top but allows specific fabrics and design elements to stand out and become more prominent. This is for those of us who have an insatiable need to maintain our sense of individuality and resist, at all costs, the trap of following the crowd. Not that the “crowd” are a bad bunch of people but as for me personally, I have no desire to have home decor / bed quilt, etc. to be a replica of what 2,000 other people have purchased. It is my personality and design style that I want to stand out! And for this reason, my creations, for the most part, are designed to fit the recipient. If what I have designed and created happens to appeal to the masses I consider that a bonus! When it comes to gift giving, originality is always at the top of my list. The image below is a baby quilt I finished about a month ago. It is not a 100% original – the pattern was purchased from a designer and the fabric here. However, I highly doubt there is another baby quilt with the same pattern and fabric combination! I belong to a quilt committee at the hospital where I work and our mission is to make quilts to be given to our patients and families who transition to palliative or hospice care. For me, this quilting group represents a unique and creative way to give back – not only to the recipients but within the group as well. Members of our group represent all skill levels – some cut fabric, others piece quilt tops, others do just the ironing or tying off. 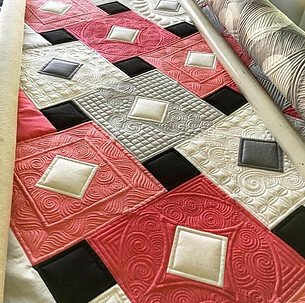 True, when we meet it is primarily for the purpose of replenishing our quilt stock but these 6 – 7 hours are also an opportunity to learn or instruct new techniques or share quilting tips. 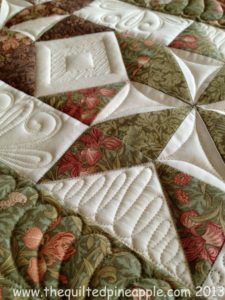 Each of us is well aware of the potential struggles involved with making any quilt and anytime we can offer a tip to make any aspect of the process easier for another makes the event a win-win situation for all. The first is an adaptation of a pattern called “Off the Rails”. The second is made up of practice blocks in the “Disappearing Four Patch” pattern. Both quilt tops shown above are made using scraps from my stash. They are not perfectly color coordinated however, these images taken with my phone camera and less than optimal lighting do not render the color representations to be even less accurate. To get a better picture of the fabrics used, material of similar color and pattern can be found here. Once the batting and backing are added, the perimeter top stitched and the quilt the layers tied together they will be ready for giving. So, there you have it. My top 5 (and a bonus) reasons for quilting. What are your reasons for making quilt or for making anything? Is the reason you began quilting still ring true today or over time have you developed a new source of motivation or inspiration? Should You Buy a Long Arm Quilting Machine ? The long arm quilting machine gets its name from the shape and length of the arm which is long allowing for an over sized throat to accommodate large quilts. Typically, the machine is attached to the frame (could be a large table) where the machine itself is placed on a track that allows the machine to be smoothly rolled along the length of the frame. As one section of the quilt is quilted the operator grasps the handles and slides the machine down to the next section. On the surface this sounds like quite a deal – especially the computerized versions. All you do is load your quilt, select the program, set the needle in position and press the ‘on’ switch. The machine does all the work while you head poolside with a book and a bowl of berries! However,…there is more to this type of long arm machine that meets the eye and the more you know the better you understand why more – actually, a great majority, of quilters do not own one. The overall foot print is 3′ – 4′ wide and up to 14′ long. This image gives some perspective regarding the amount of space required if installing in your home. It my guess the quilter in this house also “wears the pants”. Not many family members would be willing to sacrifice this amount of real estate for something with such a small monitor and no remote control! The example above is also a very high end computerized model. It not only has the capabilities of quilting very large and king-size quilts like all long arm machines, the claim to fame are the exquisite quilt designs. The speed and accuracy of this machine cannot be matched with hand quilting or even quilting on a mid-arm machine. A long arm machine is not one you begin using straight out of the box. If you do purchase a machine like this, it will need to be set up by a trained professional. Next, you will need to invest time and money in your own training to learn how to use it and devote ample time to practice. After that you may need even more training and then more practice before feeling confident and comfortable using this on a daily basis or with a customer’s quilt. A brand new long arm with every bell and whistle imaginable will set you back in the $14,000+ price range. Generally, those who do make this purchase are actually making a business investment (as this could be a business deduction – if that helps). Lower priced models starting in the $3,000 – $4,000 price range are available. They have a much smaller footprint and are somewhat more affordable. 1) A quilt loaded onto a long arm machine will have the layers rolled onto a large roller. This keeps the layers in place and provides the perfect tension on the fabric needed for consistent quilting. 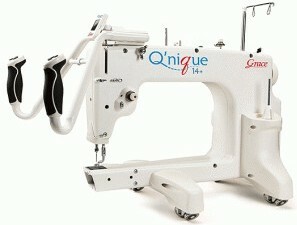 2) This machine can produce quilt patterns that cannot be duplicated by hand or any other type of sewing machine. And a few more examples so get a real feel for what these machines can do! 3) A large quilt with a pattern of minimal to moderate complexity can be done more quickly and efficiently = no mistakes or errors (unless a mistake was made while programming the quilt pattern). 4) A unique and eye-catching quilt is needed for display – to be considered more of a “work of art” than a pretty item that also provides warmth. What about hiring someone to quilt for you? If you want an elaborate and / or intricate quilting pattern or, if you are like me, it is not feasible to own one your best bet is to locate a shop or individual to do the long arm quilting for you. Again, this service is not particularly cheap but as I always say – you are getting what you pay for. Once you fully understand the process of long arm quilting and the price is easily justified. Middle of the road pricing is about .02 cents per square inch and if often determined by the quilter’s projected base pay. A quilter wanting to earn $25 per hour would base pricing of the quilt on this number. For example, charging .02 cents psi for a queen sized quilt measuring 90″ x 100″ = 9,000 square inches. 9,000 x .02 = $180 which is typically for the labor only. Additional costs could include the cost of thread, batting, binding and backing, labels and / or hanging loops. Taking this $180 and dividing it by the number of hours required to complete the quilt (say 4 hours) the net result is $40 per hour. Which sounds good until you factor in other costs: cost of the machine, electricity, time spend meeting with the client, driving to and from fabric shop, purchase price of batting and backing, cost of owning, running and marketing a small business and the top dollar amount is quickly reduced to $20 – $25 per hour. The Verdict: Is it feasible to own and operate a long arm quilting machine of your own? What I have presented probably appears to be more in favor of the argument against rather than for buying a long arm machine. However, for the independent, small business quilter where this type of purchase is more of an investment the verdict is an unequivocal yes. Additionally, the return on that investment is only limited by the amount of time and energy you have to devote to the business of long arm quilting. As far as long arm quilting for personal use goes, as long as you have the space, the skill level and the price easily fits within your budget there isn’t another reason (that I can think of) not to make this purchase. The more I am able to do for myself the better however, if owning a long arm machine allowed me to provide a needed service for others that would be a complete win – win situation! I would love to hear stories from those who use a long arm machine either for themselves or as a service to others. What additional advantages have you observed to using this type of machine and / or what disadvantages have you encountered? quilt top becomes another layer in your pile of unfinished projects. that gives it the name “fat”. No dieting here…the fat quarter has just the right amount of thread count and inches. The 18″ X 22″ cut of fabric is such a convenient size to yield a variety of sizes and colors – and it is this variety that creates the visual interest that draws the eye to one quilt over another. 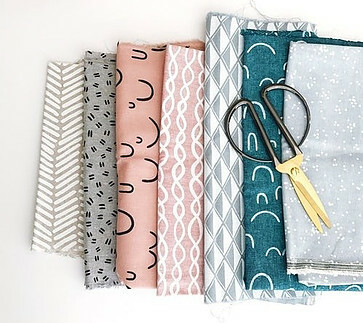 If, during your next fabric shopping spree, you find yourself undecided as to what type of precut fabric to choose I have compiled a short list of items to consider. 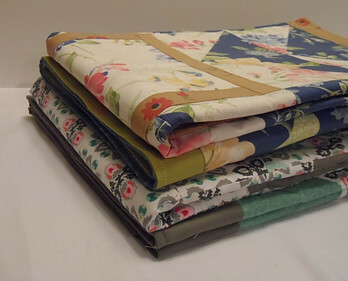 Chances are, a fat quarter bundle is exactly what you need! 1) The long, narrow fabric cut is ideal when a pattern calls for a variety of shapes or one just one shape in a variety of sizes. 2) Strips cut along the selvage (with the grain) do not lose their shape. *NOTE* Any fabric cut in the opposite direction or “crosswise” can become very stretchy and as a result will add to the difficulty nesting seams. 3) Fat Quarters are not just for quilting – it is my go-to fabric cut for a variety of other projects: tote bags, organizers, place mats and mug rugs to name a few. Below are just two examples of how a fat quarter can be cut to piece a quilt top. 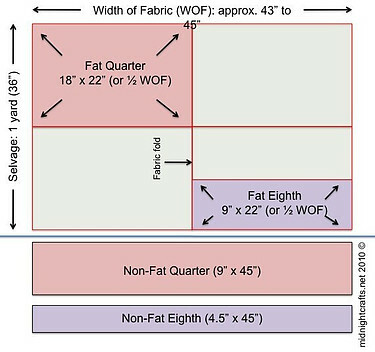 You may also notice when choosing a pattern that is labeled “Fat Quarter Friendly” the fabric cuts produce very little waste – an important factor when using expensive, high end or limited edition fabrics. presence. One such resource is allpeoplequilt.com. and The Moda Bake Shop. I should note that the website for each of the examples listed below can be accessed by simply clicking on the image. Another bonus – the pattern for each of these examples is FREE! color is basically a series of rectangles cut into two different sizes. rectangles by the entire width of the quilt top. this pattern until the desired width is achieved. This would be one row. Next, sew that patterned row to a long strip of white. together and your quilt top is ready for a border! A second Google search of fat-quarter-friendly patterns placed this wonderful quilt image before my eyes. The quilt was made by Polly @ Pieces by Polly. 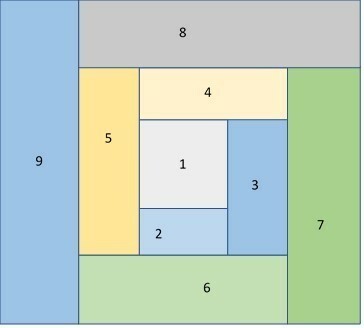 Taking a closer look, each “square” is made by creating a half-square triangle. 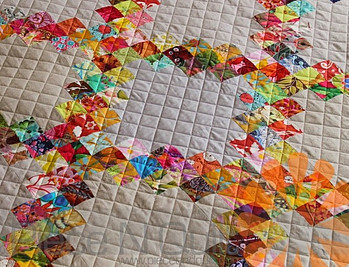 True, this involves a few more straight cuts with a rotary cutter and ruler but these individual pieces cut from a fat quarter are larger than the typical 5″ square making the creation of each ‘square’ much easier. 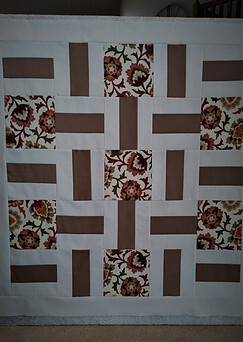 And these larger sized squares translate into a quilt top that can be pieced together and completed much more quickly. I have some metallic Christmas fabric similar to this in my Christmas stash – it’s worth taking a look to see if I have enough to give this one a try! 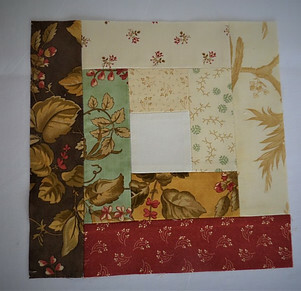 If you aren’t yet ready for a Christmas project here is one featuring an autumn theme. 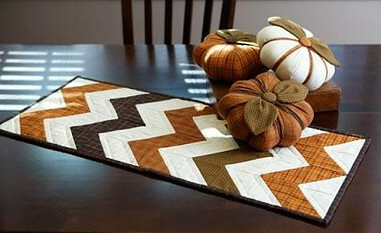 However, as we all know, the chevron pattern is season-less and theme-less. 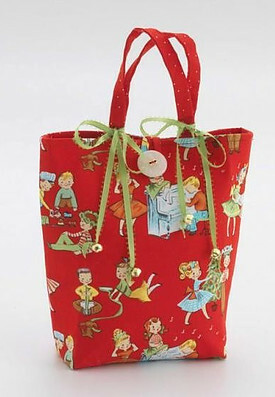 Do you have scraps of favorite fabrics stashed away in your sewing closet or basket? Here is a great way to use them! And it’s not necessary to limit yourself to these yummy autumn colors. This pattern can be adapted for any season or holiday. In place of pumpkins make large fabric Christmas ornaments, apples, watermelons, beach balls. Reduce the size of the table runner to a mug rug size – the pumpkins reduced to a pin cushion and you have the perfect gift for the sewist on your birthday or Christmas list. You are only limited by your imagination! 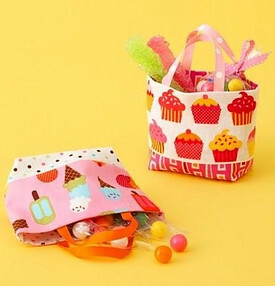 Quilting fabric makes the most adorable mini treat and gift bags! 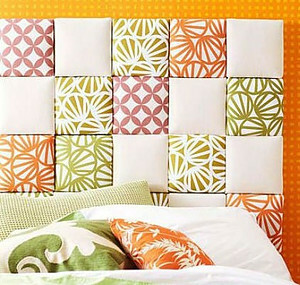 The construction is just as quick and easy and provides a perfect canvas for most any embellishment. These bags require only (2) fat quarters. If a larger bag is needed – for example, a tote bag, just add another fat quarter – or two. Cut another square or rectangle of fabric and attach to the front for a pocket. Add ribbon, a key chain, buttons, pins, charms or badges. 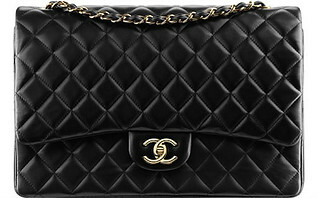 In addition to these bags cute factor is their practicality. They are durable and reusable. The goal of this post is to provide a short but very sweet introduction to fat quarter fabric cuts and the variety of projects that can be created. It is my dream that when you hear the term “fat quarter” you become inspired, get out those lovely fabrics fabrics and create something unique today! Answer: That really shouldn’t be a consideration but for cat lovers out there, I’m throwing in this one for free! Each year the heads of sewing machine industry gather around a large table putting their heads together to generate strategies to lure every sewist from all levels of experience and expertise to purchase the “latest and greatest” sewing machine. The past 10 years alone have witnessed a consistent and dynamic evolution not only in the manufacturing process but in the way these sewing machines are used. 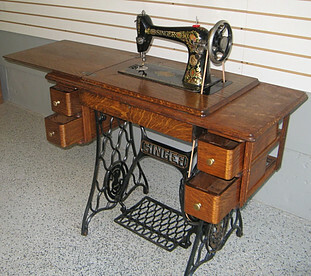 This is a far, far cry from the time when I was a little girl sitting beside my aunt as she made quilts on a treadle Singer sewing machine – one very similar to the image below. No doubt, back in that day (late 1890s to the early 1900″s) the decision-making process was quite simple. Aside from availability, price was likely the only factor. 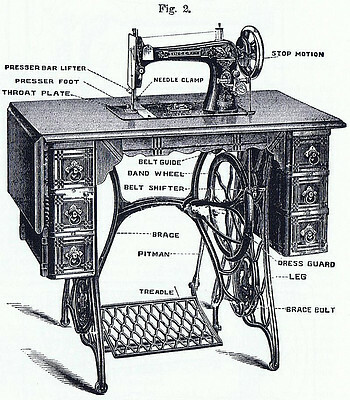 The basic requirement for a sewing machine was also quite simple – the only thing needed was a threaded needle to go up and down through the fabric to catch the bobbin thread from underneath. These machines sewed only 1 stitch – a straight stitch, and each stitch was the same length. Period. The power was provided by placing your foot (or both feet) on the rectangular shaped metal platform near the floor and bending your ankles up and down. When your feet stopped moving, so did the machine. These machines were heavy – made of steel with a wooden cabinet and they were made to last. This was well before the day of planned obsolescence and the luxury of tossing it (or anything else, for that matter) in the dumpster (or back alley) and buying a new one after 2-3 years was unthinkable. Today, choosing a sewing machine is not so simple. In the interest of time I will not even attempt to describe even a fraction of machines available and their respective attributes however, you can click on a picture or manufacturer’s name below each machine and it will take you to the respective website – each site is guaranteed to provide enough eye candy to put you in a sugar coma! I should note here also, this is a very small sampling and the images only represent the top of the line models from each manufacturer. Now that you’ve done a little window shopping let’s return to reality and discuss what you came here for – the top five items to consider when purchasing a sewing machine. 1) BUY THE MOST EXPENSIVE MACHINE YOU CAN AFFORD. 2) BUY FROM A REPUTABLE, LOCAL DEALER. Do this and the remainder of the list will pretty well take care of itself. Buying a sewing machine is, in my opinion, a major purchase and…you do get what you pay for. However, if you took a look at the high end models and even a few mid-range models you also see it not necessary to go straight to the top. Man of these newer machines may do everything but bake bread and wash windows but there is no need spending money for features you do not want or need or may never use. On the other hand, buying as much machine as you can comfortably afford saves you the hassle of having upgrade later on down the road or ending up with a machine that lacks the workmanship and durability to perform your desired tasks. Regarding using a local dealer – when you machine needs servicing or a repair you know exactly where to go. It also helps local businesses. These business owners and employees can offer you advice and instruction that you will not get from an online review. 3) Decide what exactly you want to do with your sewing machine. 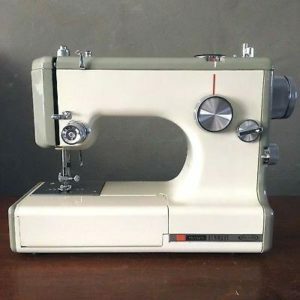 If a straight stitch or maybe a zigzag stitch or making a button hole now and then is all you are looking for then your best bet is to find a machine with as few options as possible. If you plan do any decorative stitching or embroidery then it is best to look into a model that accommodates an embroidery hoop. For creating embroidery on a large scale, i.e., a business, then you need to look into a computerized machine with a few bells and whistles. Many models have the option to purchase or download patterns and will practically do the work for you – all you have to do is set it up. 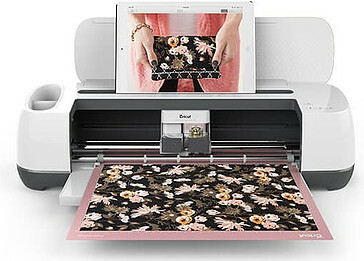 On the subject of running a business such as a quilting business, you may want to invest in a machine that not only sews a variety of stitches and stitch lengths but on that also incorporates quilting software. This takes the process to another level that allows you first design your own quilt before piecing and sewing it together! 4) Determine if your machine needs to be portable. Most of the time a sewing machine will be set up in a designated room or area of your home and stay there. 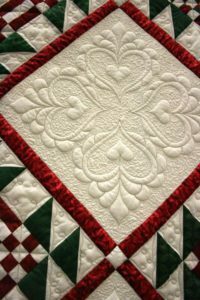 However, there may come a time when you will want to join a quilt guild or attend a retreat or special class and will need to be able to bring your own machine. If these activities occur frequently I would check the overall weight specification. Typically, the heavier the machine the higher the quality. It also usually means less noise, less vibration and increased durability. However, for frequent traveling you may want to consider a lower end of the mid-range models. If it becomes damaged in transit the cost for repairs is minimal compared to the costs of repairs or replacement of a high end computerized machine. 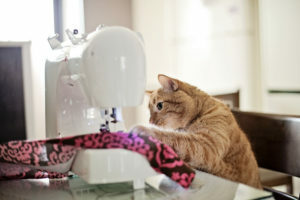 It seems there is a growing number of teens, tweens (and according to Pinterest, cats) are becoming interested in sewing. If you have younger individuals in your home who may be using the same machine you should consider purchasing a machine that won’t feel too intimidating to use. Returning to the business model, if your interests extend into teaching others to sew or quilt, a machine that is well-built but with a lower learning curve is your best bet. Considering today’s shopping trends it goes without saying, it is always a good idea to first do a little online research. However, before making a final decision, grab some fabric swatches and head down to your local sewing machine dealer and take a “test drive”. They will have a variety of floor models available for you to try as this is really the best way for you to make this type of purchase. The result? A sewing machine that fits the way you sew and the establishment of a relationship with a local merchant who can quickly and easily provide the service and repairs when you need them. What? Make a log cabin quilt block in just 10 easy steps? Why not? If you have been following along, in previous posts where I concentrated on the very basics of cutting and sewing fabric and discussed the benefits of using pre-cuts as a quick and easy way to learn how to piece together your first quilt top, then you are ready for this. You have mastered the skills of cutting accurate fabric dimensions and sewing a consistent seam ( typically 1/4″ ) and in all likelihood you are tired of those cute 5″ squares and have begun to ask what other patterns or fabric cuts could I successfully attempt next? I know this because I had the same question after making my 10th or 12th lap quilt using 5″ precut squares or charm packs. Digging through my stash of fabrics and downloaded block patterns I came up with this one: a super simple, quick and easy log cabin. 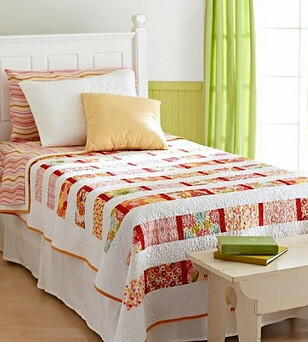 This is a classic design and a favorite of just about everyone – quilters and non-quilter’s alike. The distinct pattern is perfect for using scraps of fabric in contrasting colors – this is what makes the design pop and stand out from many other block designs. I also think it is the gradation in “log” sizes that gives the overall design movement – it visually carries your eye in a comfortable circular motion that adds to its visual appeal. These are just two of probably 200 or more different variations! Both log cabin blocks shown above were made from a jelly roll from the fabric line “Sweet Cherry Wine” by Blackbird Fabrics. As you can see, this fabric line utilizes a wide range of color contrasts and interesting prints. This particular pattern is from a hand drawn grid using (1) 2″ square and 8 strips with a beginning measurement of 2″ x 1″. Each strip is then cut 1″ longer than each previous (2×2, 2×3, 2×4 etc.). Now that you know a little more about the log cabin design let’s dive in go through the process, step by step. Take a look in your stash and see if you happen to have a jelly roll on hand. The 2 1/2″ wide by 40″ – 42″ cut lengths are the perfect pre-cut to use for a log cabin quilt top. And if the prints are too busy or the colors fall too close together on the color wheel you can always pair that fabric with a coordinating or contrasting solid. For those of you making a log cabin for the first time I am going to use a different pattern than the one from my example above. It is a simpler pattern and appears to be a little easier to piece and sew. What I have chosen to use is a free pattern download entitled “Valentine Heart Coaster” from Craftsy. It is designed by Allie Hartom of Allie – oops Designs – you can also visit her blog here. 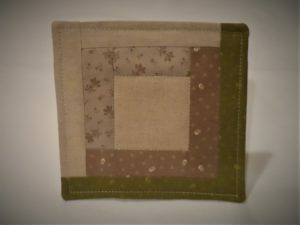 This is a super cute fabric coaster that incorporates both applique and log cabin piecing and measures 6″ square when finished. This particular pattern is new to me so I’m going to sew this block together as I write up this tutorial. 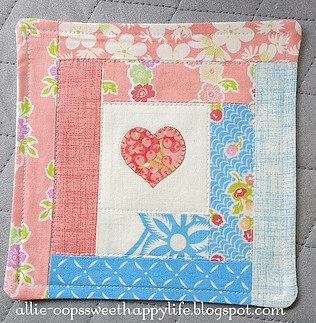 The pattern calls for a heart applique in the middle of the 3″ square but since it is almost fall I’m going to choose an apple, pumpkin or leaf applique instead. 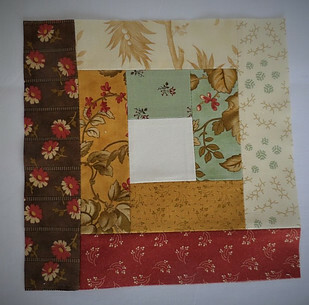 Step 1 – Choose fabric for both the log cabin strips and at least an 8″ square for the backing. Strips # 6 & #7: 1 1/2″ x 6″ Strip #8: 1 1/2″ x 7″. Step 5 – Sew the 1 1/2″ x 3″ strip to the bottom of the 3″ square (right sides together) then press the seam open. Step 6 – Continue in a clock wise fashion attaching a strip (in the order given) then ironing the seam open, attach a strip, iron open etc., until all 8 strips are in place forming a square. Step 7 – Cut an 8″ or so square of batting material and sandwich between the pieced top and backing making sure the wrong sides of the fabric are facing outward. Step 8 – Stitch around the quilt sandwich leaving a 3″ or so opening then turn inside out. With the right sides of the fabric showing fold the edges of the opening inward and pin. Step 10 – Press and admire your handiwork! 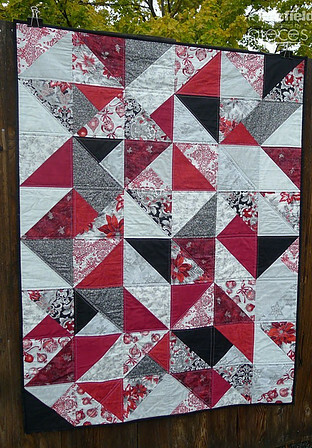 5) Pieced together with other large blocks to make a quick and easy full sized quilt. Once you have finished your log cabin block leave a comment below and include a link where we can locate and admire your handiwork! Be sure and include if this was your first log cabin block as well! What do quilting and social media have to do with each other? This is no doubt a question you didn’t know needed to be answered until it was asked. The answer has to do with productivity, time management and automation – concepts common in both elements – quilting and managing / leveraging social media. It is through our ability to utilize all tools available (automated or not) that will allow us to manage our time and be as productive as possible. And we all know how time is money. Yesterday I found myself in Google-land in search of the when, where, how and why of social media. After a few minutes of scrolling through several sites I began to notice a pattern – each one was promoting a strategy or program for harnessing the powers and analyzing the effects of social media for your business. The duration of time it took me to do this research led me to this conclusion – managing these accounts ( like piecing and sewing together hundreds of tiny squares and rectangles) can become quite time intensive as well. To solve the time intensive task of knowing when to post what content and to which platform, “social media management tools” were developed. Such a time saver, this tool. If you have more than one account across several platforms, these tools that provide automated content posting are the only way to leverage social media to your benefit. BSMMT (Before Social Media Management Tools) existed, one had to: 1. Create their own schedule or calendar, 2) remember to use the calendar and, 3) physically post an instance of content to your website and then to each of your social media accounts. 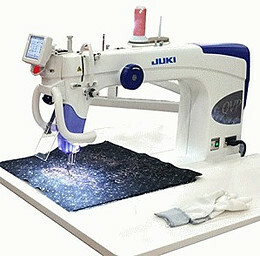 In the world of quilting the use of a sewing machine is still considered by many as an “automated” task. In generations past all stitching and quilting was done by hand. By today’s standards machine piecing and sewing is not so much an automated process but it is certainly a time saver. On the subject of quilting – that is a different matter. 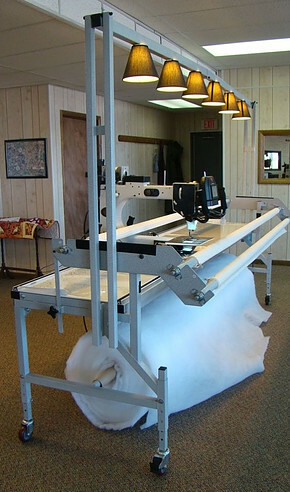 Long arm quilting has automated the whole process and the results are breathtaking. 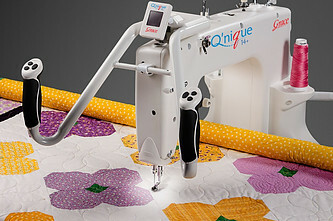 The machines used for this type of machine quilting range from a1) sit-down model with hand grips to a 2) stand up model with hand grips and for the ultimate professional a completely automated 3) computerized model. 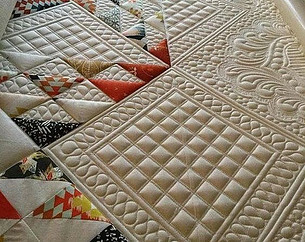 Without automation – specifically the use of one a long arm quilting machine there is no way this quilted design could have become a reality…no way this could be done by one person, by hand and in less than a decade. 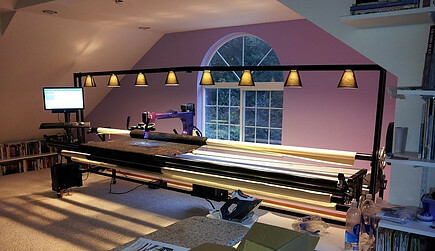 Another advancement in the world of all-things-to-be cut (fabric/paper/leather/vinyl) are the cutting machines. These go by various brands – Cricut, Silhouette, and AccuQuilt to name a few. I have not used any of these personally but I do have a couple of friends (one a scrapbooker and the other a quilter) who have a Cricut and they both love it! At a distance, any of these appear to be a very worthwhile investment and I label each an investment – each option carries a price tag). Whatever the price, the ROI is also quite high. Time saved anywhere usually always equals money in the bank. Say what you will about automation. 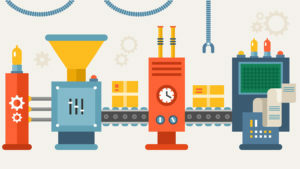 When technology serves multiple purposes and the primary being accuracy – whether it is an accurate fabric cut or a perfectly timed content posting it becomes easy to conclude automation is our best friend.